Forget waiting for Mr. Right! You can go out and find "The One" yourself when you follow the Get Married This Year plan. Celebrated relationship expert Dr. Janet Blair Page has distilled the very best of her acclaimed dating class at Emory University — the one covered by CNN, FOX, Good Morning America, and The Early Show — into this one-of-a-kind book. She's helped bring thousands of singles true love — and now it's your turn! The Power is yours — and with Dr. Page's guidance, you'll use that power to meet and marry your Perfect Guy. From designing the ultimate Spouse Shopping List to getting the right guy to commit, this tried-and-true method gives you the blueprint you need to take charge of your love life and find love that can last a lifetime — in only 12 months or less! Published in U. S. by Adams media. Also published in Korea, Japan, and Poland. Dr. Page’s next book, The Sexiest Years: Romance from Forty to Forever will be available in the Fall of 2018. Whether or not the 50’s are the new 30’s, let’s hope that 90’s are the new 70’s because being on the planet at 90 or longer is getting more likely all the time. This can be a blessing or a curse depending on how and when you take charge of your life. We will live longer. Living well – developing your personal definition of quality and setting actionable goals to achieve a quality life - is the challenge. At some point almost everyone realizes you don’t get to grow into being perfect. Oh well, perfect would be pretty boring anyway. A high quality life is a different story and an achievable vision. Quality starts with self-worth – believing you deserve a good life and that you are of value right now without achieving your own or anyone else’s illusion of being error free. Self-improvement - whether it is expanding your functional and/or emotional intelligence, finding faith, increasing intimacy, excelling in your career, or discovering your sexuality - begun now, is an infrastructure that will last forever. How many of your current habits do you really want to keep? Our attitudes and habits help determine our fate. If you are currently 40 or 50 and in good health, you have approximately 40-50 years left to drag along ineffectual and destructive choices or you can alter your course. The choice is yours. Why wait? Starting now is wisdom. At any age, the time to shape and change your game plan is now. Make other people’s opinions of you not your business. Decide that you deserve the freedom to do what you want to do (barring harm to self and others and preferably having high standards for how you choose to treat the people in your world). "Initially I had zero interest in reading 'Get Married This Year' and, more importantly, zero interest in ever getting married again. Curiosity got the best of me and I found myself thumbing through it. With fascination I read Part 1: What Am I Doing Wrong? and began to realize that my failed relationships all had one common denominator....me. This book opened my eyes. I became more aware of what I had to offer and what I didn't. I asked God to help me become a better person. Ironically enough, I attracted and am with the kindest, most loving man on the planet! For the first time since my divorce over 20 years ago , I would actually like to get married. Thank you Dr. Janet Page for helping me see that change starts within." "This book is about developing and maintaining a committed relationship with the best person for you. The book is really engaging, practical, and extremely fun to explore. I own a spa and I have read this book mainly so I can be able to suggest some of Dr. Janet Page' s advice to my clients who entrust me with their personal issues during their treatments. I have it in my waiting room, and my clients love it. Loved the 'Love Resume' idea, and all the helpful quizzes. This book is providing a mathematical formula to finding the love you deserve! Dive in. You will emerge happier." “I followed your advice to take every opportunity. I was on a terrible blind date when another guy asked about my relationship. I said, ‘He’s probably nice - but not my type'. He asked, ‘Am I your type'? "Heed the old cliche` when you point a finger, there are three more pointing back at you." "Nothing dampens a love relationship faster than yelling, meanness, and overall immaturity. After all, it takes a grownup to have a good marriage: in fact, it takes two. Character assassination is not foreplay." As someone who's been married for quite some time, I can say that this book is full of real, practical advice that really rings true and not just for those that are single. Sometimes in a relationship, after it has matured, you can forget some of the fundamental basics of respect and consideration to yourself and your partner. All those things you try to do while catching a partner, should be continued after you've snared them, if you plan to keep them. 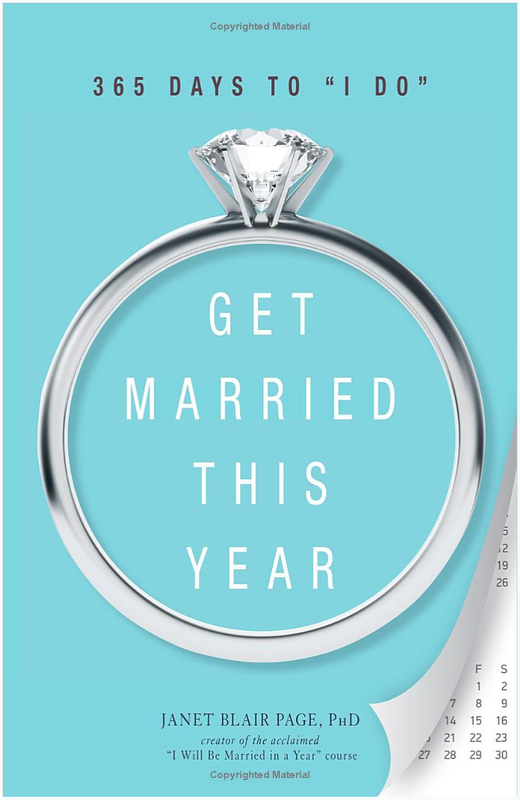 "If you are looking to have a ring on your finger this year, but don't have the person you want to slip it on there yet, treat yourself to a copy of Janet Blair Page's new book. Even if you are in a relationship this book has some very good introspectivetips that all of us can use either as a new guide or a good "Kick in the pants" reminder." "I'd recommend the book for those looking to find the right person to form a long lasting relationship, even if marriage is not the desired result. It's a quick read and offers plenty of good advice." This book is about developing and maintaining a committed relationship with the best person for you. The book is really engaging, practical, and extremely fun to explore. I own a spa and I have read this book mainly so I can be able to suggest some of Dr. Janet Page' s advice to my clients who entrust me with their personal issues during their treatments. I have it in my waiting room, and my clients love it. Loved the 'Love Resume' idea, and all the helpful quizzes. This book is providing a mathematical formula to finding the love you deserve! Dive in. You will emerge happier.